THE METAMORPHOSIS OF WESTERN ROAD Probably the greatest change wrought to the face of Brighton during this century, has been the rebuilding and widening of half the length of Brighton’s Western Road. The original North side of this road was a veritable hotch-potch of irregular buildings, many of which had been built as private houses, but had later suffered the indignity of having shop fronts built out over their front gardens. Numbers 144 to 148 were good examples of this. The roadway from Hampton Place to North Street was very narrow, except for a short selection between Marlborough Street and Regent Hill, which had been widened prior to 1914. About 1925 the Brighton Corporation decided to rebuild this side of the road, by purchasing the freeholds and letting the land on building lease. A new building line had been established in 1906, when shop properties were built over the gardens which then stood in front of Codrington Place, between Montpelier Road and Hampton Place, and the new building had to conform with this line. A start was made in 1926, when Stafford’s old premises were demolished, and replaced by the present modern store, now Littlewoods. After this, during the next ten years, building after building was removed and replaced, until by 1936 the transformation was complete. Rebuilding was not carried out in sections, but just here and there, as opportunity arose. The succeeding photographs, which depict the scenes of those times, are, for convenience, grouped sectionally and not chronologically. It is interesting to recall that the old Bon Marché premises, at the corner of Spring Street, were used as temporary premises by Staffords, Carters, Boots and Wades, whilst their premises were being rebuilt. 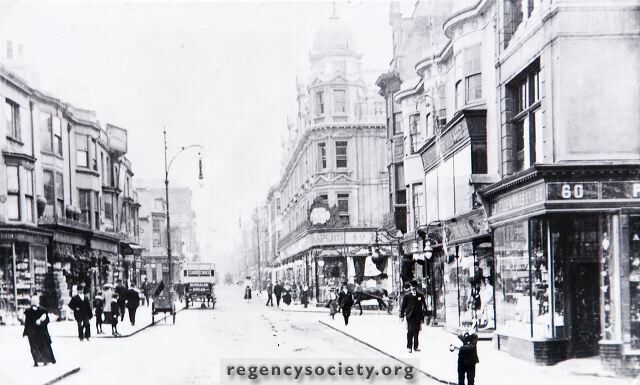 Above: Western Road, from Castle Street to Sopers, in 1908. This photograph shows how narrow the road was at this time, but the scarcity of traffic more than compensated for this. Additional Information: Western Road was named after the Western family who once owned Preston Manor.